Tommaso Vitale est chercheur au Centre d’etudes Européennes et de politique comparée, Associate Professor de Sociologie à Sciences Po, et directeur scientifique du master Governing the Large Metropolis à l’École Urbaine. Tommaso Vitale (Ph.D in Sociology, 2003, MA in Political Science, University of Milan) is a Researcher at the Centre d’etudes Européennes et de politique comparée, Associate Professor of Sociology at Sciences Po (Paris, France) where he is the scientific director of the Master "Governing the Large Metropolis", researcher at Centre d'études européennes, member of the LIEPP and of the research program "Governing the Large Metropolis" and of the research program "Cities are back in town". Mechanisms of racism diffusion and legitimation. He has co-founded the International Research Network UrbaRom. 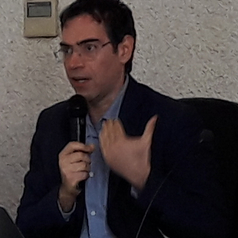 His previous researches were in the fields of Comparative Political Sociology (on participation, associations, civil society, civism) and Comparative Urban Sociology, and he has published books and articles on conflicts and urban change, on spatial segregation, on social service planning, and on élite and local governance of industrial restructuring. His papers can be downloaded on Spire. He is co-editor of of the peer review Journal PArtecipazione e COnflitto. The Open Journal of Sociopolitical Studies. He has been visiting professor at the Vincent and Elinor Ostrom Workshop in Political Theory and Policy Analysis (Bloomington, Indiana University). He coordinates the comparative ANR research MargIn (with O. Legros ; C. Bergeon).